Ear candling or thermal-auricular therapy is a pleasant, safe and non-invasive treatment. The treatment, previously known as Hopi ear candling has been used by Native American tribes for generations. Ear candling helps your body remove excessive ear wax, clear sinuses, alleviate rhinitis and headaches. Spiritually ear candling assists in opening up the ear chakras and augments claire-audience skills in particular. The therapy includes candling of both ears and a face massage enhancing the effects of the ear candling treatment. The whole procedure lasts approximately 45 mins. (and the meeting around 1 hour), leaving you relaxed, at peace and with more clarity. A mini reading / life guidance with or without oracle cards is an added bonus at the beginning of the session to help you with moving forward in your life. Remaining in a peaceful quiet environment for the remainder of the day is therefore recommended. The treatment results in a gentle detoxification so it is also advisable to drink larger amounts of water following the treatment, in order to facilitate the process. 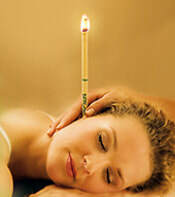 Ear candling can be repeated after 3-4 weeks depending on a condition. The gap between treatments allows the body to naturally continue the treatment and/or the healing process. The treatment cost is £45 per session (approx. 1hr). Once you book I will be in touch via e-mail. Please leave your e-mail address in the "Special notes" field upon booking, or I will contact you via the e-mail you use for Paypal payment if you pay from your Paypal account. Payment via the secure Paypal "Buy now" button below or via bank transfer (ask me for details via e-mail at ExpandingC@gmail.com). Please note you do not need Paypal in order to make the payment by clicking the button above. I had a lovely ear candle therapy treatment with Aga. She has a very calming and professional approach, Aga explained in detail the process of the treatment and made sure I was comfortable through out! I would recommend this treatment to anyone and especially when your in Aga's hands. "That candling was amazing. I can breathe properly. Am drinking lots of water and am positive..."
What to do before, at the event and after? Upon booking your space you'll receive an e-mail confirmation. We will then arrange a suitable date and time for the treatment. Please drink plenty of water on the day of the treatment and several days after. Thank you! I'm so looking forward to our wonderful session.